Applied Ergonomics is aimed at ergonomists and all those interested in applying ergonomics/human factors in the design, planning and management of technical and social systems at work or leisure. Readership is truly international with subscribers in over 50 countries. Professionals for whom Applied Ergonomics is of interest include: ergonomists, designers, industrial engineers, health and safety specialists, systems engineers, design engineers, organizational psychologists, occupational health specialists and human-computer interaction specialists. 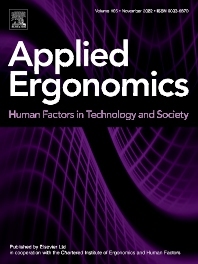 Applied Ergonomics welcomes original contributions on the practical applications of ergonomic design and research. Areas covered include applications in the office, industry, consumer products, information technology and military design.